Hanoi (VNA) – National Assembly Vice Chairwoman Tong Thi Phong on February 8 hosted a reception for a delegation of former Vietnamese teachers who live in Thailand. Underscoring that the Party and State highly values the contributions of the Vietnamese community abroad, including those in Thailand, to national growth, Phong stated that the Party and State consider the community an indispensable part of the nation and an important driving force for development. 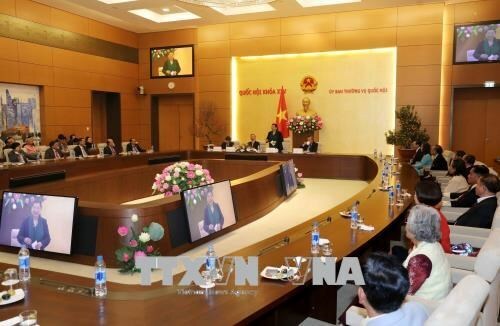 She said the Party and State pay great attention to creating optimal conditions for Vietnamese abroad to settle down, integrate into local society, promote national culture and join hands to develop the country. Phong expressed her hope that Vietnamese teachers and the Vietnamese community in Thailand will continue maintaining the use of Vietnamese language and promote the image of Vietnamese nation and people to the world. Representatives of the delegation showed their delight at Vietnam’s progress.